The Lisa Ann Morgan Plaque and Bench is located adjacent to the Campground area of Snowmass. Photos of it are below (click on images to enlarge). These photos were taken in July of 2017. Her co-workers built the bench and installed it in 2005/2006. Thanks to Laurel Kressler for her help with the information on this page. Lisa Ann Asbill Morgan died Feb. 15 in Snowmass Village. A Feb. 26 service is planned in Lubbock, Texas. Lisa Ann Asbill Morgan, 44, a resident of Snowmass Village and former resident of Lubbock, Texas, was killed in Colorado on Feb. 15. She was born Aug. 10, 1960, in San Diego. 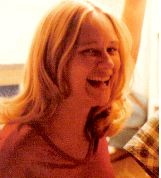 Lisa was raised in Lubbock and attended Coronado High School, class of 1978. Lisa was the oldest of five children and had two grown sons. Her first grandchild had just arrived. Lisa was a certified underwater welder, a dive master and an avid skier. Lisa was the former manager of the Playhouse Toys and owned a scuba diving school when she resided in Lubbock. Lisa moved to Florida, where she owned a live rock business before she relocated to Albuquerque and ultimately to her beloved Aspen. Lisa was employed by The Snowmass Club in the engineering department for the past 4 years and had just begun a new job with Timberline Condominiums. Even as a young girl Lisa loved attending summer camp and spending time outdoors. Whether on the beaches of Mexico or the ski slopes in Aspen she was the happiest when the sun was shining on her face. Lisa will be greatly missed by her heartbroken family. She is predeceased by her father, Smith L. Asbill Jr., M.D. She is survived by her mother, Marjorie Asbill of Albuquerque, her sons Benjamin Furstenwerth of Arkansas and Greg Furstenwerth of Washington. She is also survived by her grandson Adrian of Arkansas and her siblings: Leslie Prichard and husband Troy of Albuquerque, Robert Asbill and wife Julie of Bella Vista, Ark., Lea Anne Oliver and husband Todd of Waco, Texas, and Laurel Kressler and husband Rob of Albuquerque, and nieces and nephews Brian, Brishel, Jake, Brooke, Alex, Morgan, Ashlea, Chris, Cody, and Austin.Services will be held Saturday, Feb. 26, at 4 p.m. at Resthaven Funeral Home in Lubbock, Texas, with the Rev. Tedd Dotts presiding.